All children go through phases. Maybe they went through a period of watching a certain animated movie over and over again, only to get over it and move on to a new obsession. As their clothes and toys change and they start to grow, how they choose to decorate their bedrooms may change as well. How should you prepare for the twists and turns of your kids graduating from one phase of life to the next, and suddenly wanting to change their surroundings to match? Give your kids’ rooms some fun paint colors that reflect who they are but aren’t so childish or wild that they’ll be begging you to repaint. Professional painters in Marietta, GA, have found that the following paint colors are great choices for any child’s bedroom. 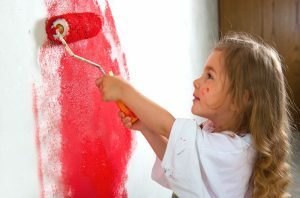 Browse through these interior painting colors to decide which one is right for your child—both now and as they continue to grow. A color based on the natural beauty of a citrus fruit, citron is bold yellow but with a touch of natural brown to balance it. It’s a bright and fun color that gives rooms energy. And, believe it or not, citron is actually very easy to decorate around. It matches with virtually everything except for other bright colors like red and purple. As your child obsesses over a new cartoon, movie, or theme like pirates, citron will maintain the same youthful energy and still match. Pair bold red with gray to match boyish toys now and stay appropriate as they graduate to teenage toys like guitars and video game paraphernalia. Red has a positive energy that’s warm and inviting and matches with dark tones like black and natural woods. This balanced, bold, medium blue is an exciting color choice for virtually any child. It’s gender-neutral and so stylish that interior house painting companies have recently been painting cobalt in living rooms, dining rooms, kitchens, and even bathrooms. It matches with virtually every other color, but it has enough personality that it will give your kids’ bedrooms energy. You could even paint all of your children’s rooms cobalt, then give them the freedom to customize with their choice of décor. A great pairing with natural wooden furniture and bright, sunny windows, electric green is a must for kids with creative energy. It’s a positive color that looks balanced and stylish, but also has enough energy to make kids feel stimulated. Electric green walls are the perfect backdrop for your kids’ furniture and handmade art. Best of all, it’s a gender-neutral color that be feminized with other light green tones and white decor or made masculine with black and forest green. Gray might seem too mature, but a light, cool gray is just the right wall paint color to set the stage for your child’s personalization whims. Leave this color in the hands of professional painting services, because it needs to be mixed and applied carefully to nail the right tone. Too dark, and gray can look somber and severe. Too light, and gray can look boring and barely there. 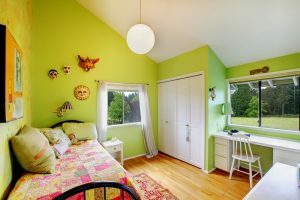 If you’re interested in giving your children’s rooms a spruce of color, contact Fillo Painting Contractors, professional painters in Marietta, to begin a fun redesign that will look appropriate until your kids go off to college.